I mated for Joe Trainor today on the Low Profile for a 12 hour inshore tuna trip. We ran to the 30 line and got there at first light and had chick birds everywhere and plenty of bait on the sonar. It was looking good and it didn’t take long to get our first bite from a 42″ bluefin on the short rigger. The morning bite stayed hot all morning until about 8 am then the bite died off. 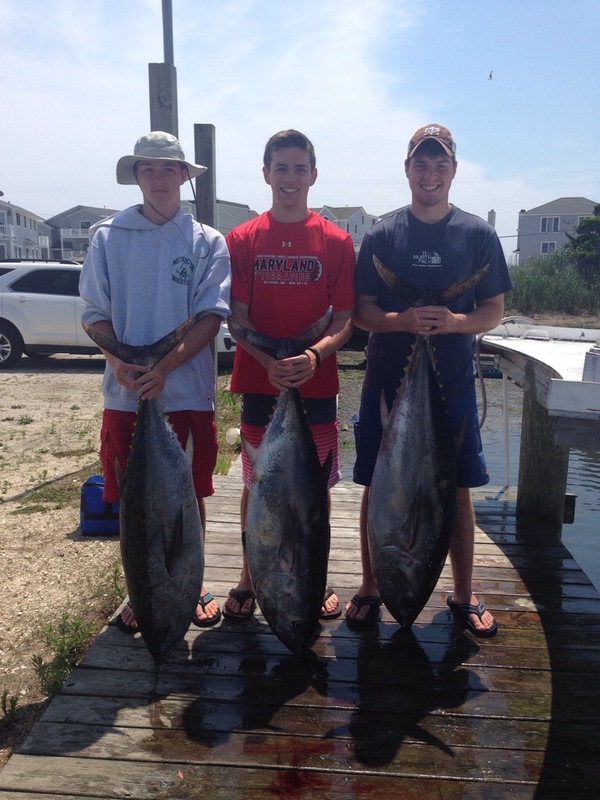 We ended up with out limit on bluefin tuna and released 2 overs. The bluefin ate pretty much any ballyhoo/sea witch combo we had out. The water was 72 degrees and green, but there is so much bait there it seems the fish will be around for awhile. Ricky thanks for a great trip! The gang had an amazing time and is already pushing me to book the Cat Island trip. Good luck in the coming months. Anytime Jim. I hope we get to fish together again in the near future! Cat Island is worth it for sure… Enjoy the rest of your summer.